The first patent was in 1792 in United Kingdom presumably utilizing a rotary kiln but the development of the modern direct reduction (DR) process began in the middle of 19th century. Since 1920 more than 100 DR have been invented and operated. Most of them have not survived. The modern era of DR production began on December 5, 1957 when the HYL process plant first started production at Hylsa. The first plant using Midrex process came into operation in May 17, 1969 at Oregon Steel mills in Portland, Oregon. A DRI production process is one in which the solid metallic iron is obtained directly from solid iron ore without subjecting the ore or the metal to fusion. The process principle is shown in Fig. 1. 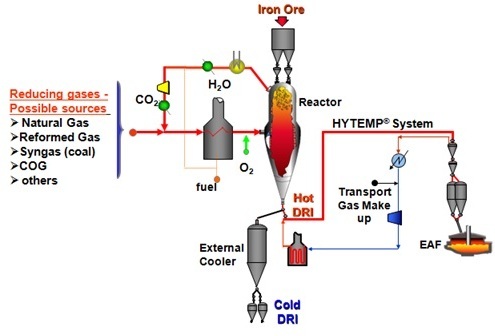 Major DRI production processes are either gas based or coal based. Feed material in a DRI process is either iron ore sized to 10 to 30mm or iron ore pellets produced in an iron ore pellet plant. In the gas based plant the reactor, the reduction reaction takes place is a shaft furnace. The shaft furnace works on counter current principle where the iron ore feed material moves downward in the furnace by gravity and gets reduced by the up flowing reducing gases. The pressure and temperature in shaft furnace in HYL process is 5-6 bars and 800-850 deg C. The same in Midrex process is 1-1.5 bar and 800-850 deg. C.
In a coal based plant the reactor for the reduction reaction is a inclined horizontal rotary kiln. In this kiln both coal and the iron ore feed material is charged from the same end of the kiln. During the movement of feed material forward the oxidation reaction of carbon in coal and reduction reaction of CO gas is carefully balanced. A temperature profile ranging from 800-1050 deg C is maintained along the length of the kiln at different zones and as the material flows down due to gravity the ore is reduced. 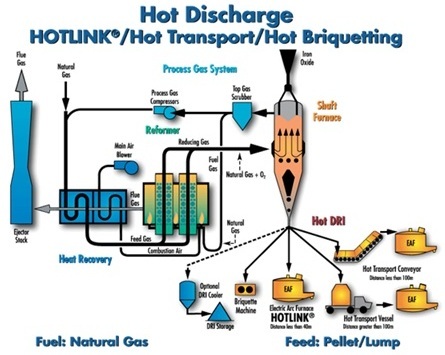 In a gas based process gaseous fuels are used. These fuels should be able to reform or crack to produce a mixture of H2 and CO gas. High methane containing natural gas is the most commonly used gas. Natural gas is reformed to enrich with H2 and CO mixture and this enriched and reformed gas mixture is preheated. In a coal based process non coking thermal coal is used. The carbon of the coal acts as a reducing agent in the process. Gas based DRI is not subjected for any magnetic separation since no contamination with non magnetic is possible. The gas based DRI is either cooled indirectly or used in hot condition. It is also briquetted in hot condition to produce HBI. 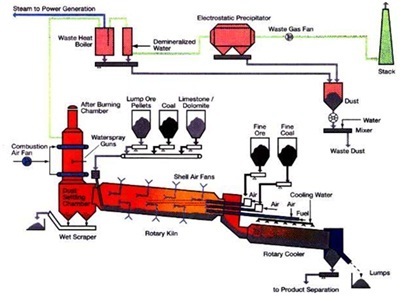 In the coal based process the hot reduced DRI along with the semi burnt coal is cooled in water cooled cylindrical rotary cooler to a temperature of 100 to 200 deg C. The cooler discharge consisting of DRI, char and other contaminants is passed through magnetic separators for separating DRI from other impurities. The separated DRI is screened into two fractions +3 mm and -3 mm. -3 mm fractions is sometimes briquetted by using hydrated lime and molasses as binders. Process flow in Coal based DR process is in Fig 4. Since DRI is produced by removing oxygen from iron ore, its structure is just like sponge with a network of connecting pores. These pores results in a large internal surface area which is about 10,000 times greater than the internal surface area of solid iron. Due to it the DRI is also known as sponge iron. HBI is produced by compacting DRI under very high pressure at temperatures in excess of 650 deg C. This closes many of the pores and limits the contact area which is available for reaction with air. It also increases its thermal conductivity. Very informative facts illustrated simply. Very nice article, I was wondering if you had any information concerning the Electrode Consumption vs. DRI use? Your article is short and clear ,I enjoyed reading it . It can be evaluated in the annual report of Midrex . I have few questions about DRI pollution control. Could you leave me your email address or email me? I have more than 15+ years experience in Air Pollution control equipment and technology in DRI Plant as well as liasoning work with Pollution control board in steel industries in Chhattisgarh…..
Do you have any idea on the temperature profiles in Midrex & HYL Reactors?